Overcast - Rain - Cool Today. 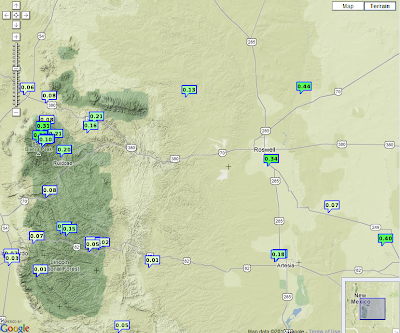 (As Of 5 AM MDT Thursday Sept 13, 2012). GRLevel3 2.00 24-Hour Rainfall Totals. 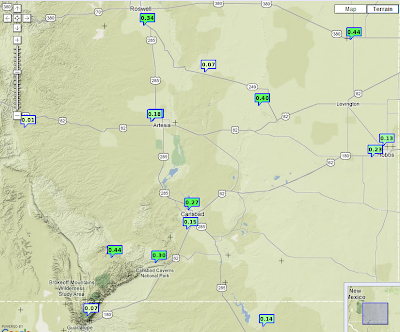 (As Of 5 AM MDT). Courtesy Of Cannon AFB Doppler Radar. Courtesy Of Midland NWS Doppler Radar. Surface Map At 6 AM MDT. As the sun rises this morning we see that a strong cold front has pushed southward throughout all of southeastern New Mexico. A steady light to moderate rain has been falling over most of the area overnight. Today will be much cooler under overcast and rainy skies. Our high temperatures are forecast to be in the 60's today and tomorrow. Northerly winds at around 15-20 mph with gusts near 30 mph combined with the rain and cooler temps will make for very chilly fall-like conditions today and Friday. No doubt a welcome relief from this summers heat and continued drought! 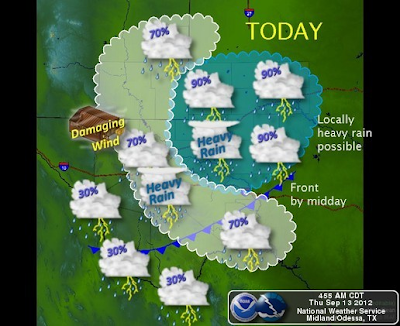 Embedded thunderstorms will also occur from time to time today into tomorrow. Some of these thunderstorms will be capable of producing locally heavy rainfall which may produce localized flash flooding. A High Wind Warning remains in effect for today in the Guadalupe Pass area. Northeasterly winds sustained at 35-50 mph with gusts near 60 mph are expected.